AI and machine learning will be of great help to make smarter and wiser decision in choosing the best out of bests. These technologies assist you in screening the candidates based on their qualification skills and experience rather than age, gender or race; keeping the process totally anonymous and secret. These technologies use algorithmic sourcing, talent mapping and text analysis algorithms that help in making your shortlisting process more effective and quick thus saving your time and money. The modern recruitment tools have revolutionised the hiring process to a great extent. But still, the final hiring decision is taken by the human. The automation process is great for the initial screening, but eventually, the final round of personal interview will be the decider of whether or not to hire the candidate. The companies today are hiring remote workers from around the globe as the talent pool is highly global. To screen such candidates, the companies use video conferencing. The video conferencing offers the same assessment with just a few questions. It is, therefore, a good idea to interview the candidate over the video rather than arranging the interviews. It is faster and cheap. Your recruitment team is bound to handle volumes of data while screening the candidates and making connections between your data points. For this, the data analytics software is a must-have. The data analytics vendors are working on the best possible methods to help you with generating the report and organized network analysis and to exchange the information with people in your organization. A positive candidate experience will certainly fetch you some brownie points. Once you establish the goodwill you are certain to hire the supreme talent available in the market. You can achieve this by speeding up the overall hiring process, which will depict that you are genuinely interested in hiring the right candidate very soon. Reasonable application requirements and quick feedback regarding the application status is also an area to improve the overall candidate experience. The current crop is tremendously talented, highly educated, and extremely professional. They value the work-life balance. Retention of the talent is important. With just the additional perks and incentives you may not be able to achieve complete retention. But this could be possible by investing in a good employee wellness program. The wellness program help in increasing productivity and maintaining a positive working environment in your organization. One of the important hiring strategies for 2018, is offering remote work either full-time or part-time. The number of employees working remotely has increased tremendously. This may due to the flexible working hours and work from home benefits. For the employers this option is best as it reduces the cost but boosts productivity. 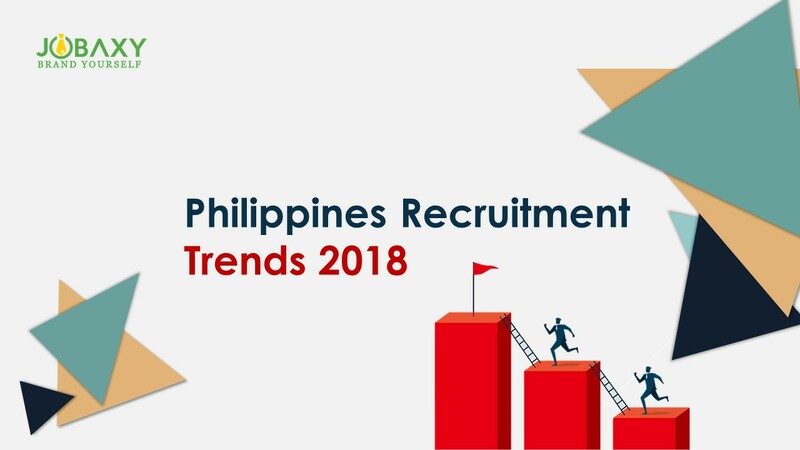 To sum up, it is necessary for the HR professionals and recruiters to use the technology like AI, machine learning and video assessment for the hiring process in 2018. This will make the hiring process more effective and fast. For all the latest techniques in the hiring process, career tips, career advice in the Philippines, visit Jobaxy.com. Jobaxy is the leading online job portal in the Philippines.